Nest Rose Noir & Oud Liquidless Diffuser Refill features Rose de Mai and smoky oud combined with hints of incense, black leather, and patchouli. 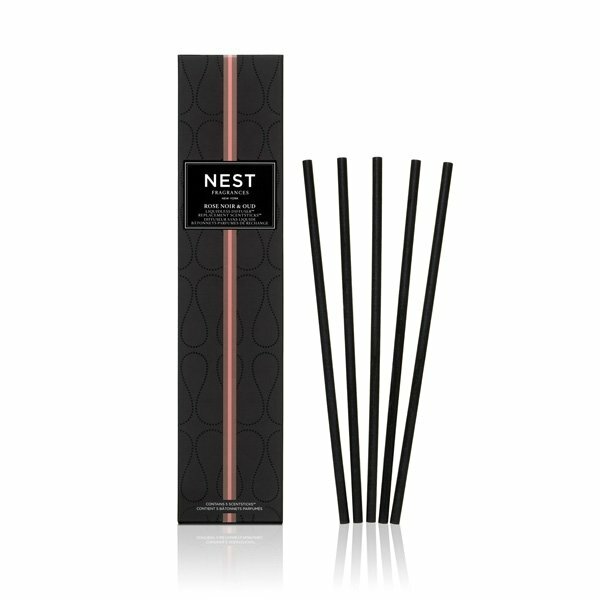 Nest Liquidless Diffuser Refill are a first-of-its-kind innovation, Nest Liquidless Diffuser™ delivers a unique and beautiful way to transform any room. The innovation begins with the ScentStick – each one has been infused with pure fragrance oil to impactfully release scent. Liquidless Diffuser Refill packs come with 5 ScentSticks so you can adjust the level of fragrance to your preference. Spill proof and maintenance free, Nest Liquidless Diffusers uses state-of-the-art technology to release 90 days of your favorite Nest fragrance, without a flame or a liquid!